February 1959 - Oh Boy! A traumatic three week period begins for Cliff Richard who loses his voice with laryngitis and is in a near state of collapse due to the hectic work schedule placed on him. He was due to begin a week long residency at the famous Lyceum Ballroom in Charing Cross, London, but rioting broke out on the first night. Cliff was pelted with tomatoes and eggs and the concert was abandoned before he even sang a note of his opening number “Baby I Don’t Care”. Cliff lost his voice completely at the worst possible time as on the following Monday and Tuesday 9th and 10th February he was due to record his debut album live before a selected audience at the Abbey Road Studios in London. In order to get himself fit again he cancelled the remainder of the Lyceum Ballroom dates until Saturday 7th February and an appearance on ATV’s Jack Jackson Show on Wednesday 4th February. The one booking Cliff didn’t want to miss was his “Oh Boy!” appearance the following Saturday (7th February) as he was due to sing five solo numbers and three duets on the show. But his condition deteriorated rapidly and he was forced to cancel on Friday, the day before the live broadcast. SEE NME ARTICE 6TH February “CLIFF’S SORE THROAT LEAVES 'OH BOY!' DOUBT. Cliff managed to fulfil the debut album recordings despite the laryngitis. He had appealed to Columbia (EMI) for them to postpone the sessions but they insisted it went ahead as they had spent £200 on setting up the studio and arranging travel and refreshments for the 200 fans drafted in from both this country and Europe. “I sang some duff notes on that album” noted Cliff, but nevertheless it has still come to be regarded as one of Cliff’s classic recordings. On the Wednesday morning after the recordings (11th February) Cliff had totally lost his voice again. He was due to embark on a five day concert tour that day, but he was almost speechless. A doctor was called who warned Cliff not to sing for two weeks and a holiday break was advisable. Cliff however refused to disappoint his northern fans. Throughout a 200 mile motor journey from London to Hull he treated his throat as medically prescribed, but on arrival at the theatre his condition had not improved. He bravely undertook both performances that night (11th February) but singing was physically impossible. The audience still applauded and cheered however at his courage. To make matters worse both Drifters drummer Tony Meehan and rhythm guitarist Bruce Welch went down with the ‘flu’ after the show. As a result the other four dates on the tour at Wigan, Newcastle and Sheffield were cancelled. After recuperating at home for two days he joined his friends Ray Ernstone and Dave Riley and travelled on impulse to Brighton for the weekend of (14th and 15th February) to get away from it all . (SEE NME ARTICLE “MY LOST WEEKEND “ 20th FEBRUARY.) He finally regained his voice and returned to his live concert schedule the following Saturday 21st February at the Town Hall, Birmingham. CLIFF RICHARD had to miss his guest spot in ATV's "Jack Jackson Show" on Wednesday because of throat trouble, and there is a big doubt whether he will be fit enough for "Oh Boy!" tomorrow (Saturday). He also had to cancel his appearances at the Lyceum Ballroom, London, where he had been at the centre of sensational scenes on Monday. Rioting among the dancers broke out as he made his entrance for the first of the week's cabaret spots in this major London dance hall. Rock 'n' roller Vince Taylor, who was in the audience, said: "They even threw people at Cliff! I don't think they liked his pink jacket." On Tuesday it was announced that Cliff would be unable to fulfil his engagement as he was suffering from laryngitis. The extent of his illness was more serious than was originally thought. Young singer Terry Wayne ably stood in at short notice. Billy Fury deputised in the Jack Jackson Show on Wednesday. Due to his condition, there is grave doubt whether Cliff will be appearing on "Oh Boy!" on Saturday night. Jack Good expressed concern as Cliff was due to sing five solo numbers and three duets on the show. Next week Cliff is due at EMI recording studios to record his new LP. There will be an audience of boys and girls from different countries. NEW Columbia signing Dickie Pride makes his television debut in ABC-TV's "Oh Boy!" on Saturday, February 28. Dickie, another Larry Parnes discovery, was signed by Columbia a and r man Norrie Paramor this week. Ronnie Carroll returns to the show on the same date. Another re-booking is that of discovery Roy Young, who guests tomorrow (Saturday). Among other bookings are: Riki Henderson and Jerry Dorsey (February 21). Billy Fury (February 14 and March 14), Mike Preston and Vince Eager (March 7) and Don Lang (February 14 and 21, March 14 and April 14). Bill Forbes deputizes for Cliff Richard who was suffering from larynigitis. Cliff had hoped to appear in this show that marked the long awaited return of Marty Wilde, who had been out of the series since 18th October 1958 as a result of a wrangle between his agent Larry Parnes and Jack Good. Cliff was due to sing 5 songs and duet on 3 numbers with Marty Wilde. Neville Taylor and the Cutters miss the 7th and 14th February shows. This is their first absence since the start of the series in September 1958. Cliff records his live debut album at the Abbey Road studios. (See Tuesday 10th for photos and sleevenotes). On February 9th and 10th, 1959, a rock 'n' roll galaxy transformed the famous E.M.I. recording studios in London's select St. John's Wood. Several hundreds of Cliff's fans were invited along to see this young star make his first LP and it was some party! Cliff selected all the tunes himself for this record and pays tribute to other stars and the songs that made them famous. With their great solo instrumentals The Drifters, Britain's greatest ever rockin' group, contribute to make this a truly memorable disc. To give you an idea of the exciting atmosphere, on-the-spot photos were taken by Ken Palmer and are reproduced on this cover. Cliff loses his voice again after recording for his debut album “Cliff” on Monday and Tuesday. This morning, about to embark on a five day concert tour, he was speechless. A doctor was called who warned Cliff not to sing for two weeks and a holiday break was advisable. Cliff however refused to disappoint his northern fans. Throughout a 200 mile motor journey from London to the Cecil Theatre in Hull he treated his throat as medically prescribed, but on arrival at the theatre his condition had not improved. He bravely undertook both performances but singing was physically impossible. Fellow “Oh Boy!” star Bill Forbes agreed to help at short notice and sang all of Cliff’s songs for him offstage while Cliff mimed. The audience still applauded and cheered however at his courage. To make matters worse both Drifters drummer Tony Meehan and rhythm guitarist Bruce Welch went down with the ‘flu’ after the show. As a result the other four dates on the tour at Wigan, Newcastle and Sheffield were cancelled. Alma Cogan returns from France to begin rehearsals for her appearance on “Oh Boy!" this Saturday. THE sore throat which forced Cliff Richard to cancel engagements last week continues to give him a great deal of discomfort. While completing his first Columbia LP on Monday and Tuesday this week, he experienced difficulty with his throat, resulting in medical treatment. On Wednesday morning when about to embark on a five-day concert tour, he was almost speechless. A doctor's further visit was necessary. Cliff was warned not to attempt to sing for two weeks, and that complete rest was necessary, if possible in the South of France. Cliff, however, refused to disappoint his Northern fans. Throughout a motor journey to Hull on Wednesday he treated his throat as medically prescribed, but on arrival at the theatre, his condition had not improved. Under the circumstances he bravely undertook both performances by contributing everything he could to the shows, but singing was physically impossible. The crowds cheered and mobbed him and admired his courage. When promoter Arthur Howes telephoned Cliff's manager, Tito Burns, in London, regarding the remainder of this week's tour, he requested that Cliff be allowed to continue even if his voice did not return. Howes felt audiences would prefer to see Cliff rather than be disappointed with a substitute or cancellation of any concerts. Accordingly, Cliff remains with the package show, promising to sing if his throat condition improves. Tito Burns said promoter John Smith, who presents Cliff Richard next week, would have the chance of cancelling his bookings or accepting him on the conditions that no guarantee could be given of his ability to sing. A BOMBSHELL was dropped by the "Oh Boy!" musical director-arranger Harry Robinson this week, when he consulted solicitors concerning the use of the now-famous name Lord Rockingham, today one of the leading recording and TV attractions. The NME understands that Harry Robinson considers he is entitled to financial benefits derived from the use of the Lord Rockingham name on the grounds that he conducts the orchestra for TV and records, created the musical sound which made this a best-selling disc outfit, and writes many of the arrangements associated with the XI. We are informed that Robinson consulted legal advisers after an advertisement appeared in the last issue of the MNE in which Jack Good announced he was the sole originator and proprietor of Lord Rockingham's XI, with the entire goodwill of the name vested solely in him. Robinson's attitude causes great surprise to Edward Sommerfield, chief of the management office representing producer Jack Good and Lord Rockingham's XI, who told the NME: "From the outset, the name was created by Jack Good who is responsible for the recording and TV contracts on behalf of the band. The whole idea was pioneered by him. 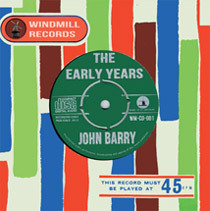 After formulating the sound he required, he engaged Harry Robinson and conveyed to him the musical treatment required. There was never any question of Robinson having the rights to the Lord Rockingham name, which remains Jack Good's exclusive property. But Robinson's composing royalties from the XI's disc sales amounts to several thousand pounds." Asked to make a statement on the situation, Harry Robinson replied "I am very sorry but there is nothing which can be said by me at this stage." His present contract with with the weekly "Oh Boy!" TV presentation ends next month but although the series has been extended until the end of May, no decision has been reached for Robinson to continue after next month, which is subject to the outcome of this dispute. Meanwhile, under Decca's auspices next week, Harry Robinson waxes the first album under his own name - comprising a collection of Latin-American tunes. Previous negotiations for Lord Rockingham's XI to be featured in the Max Bygraves London Palladium revue from June to December, have not materialised. ALMA COGAN makes her debut in ABC-TV's "Oh Boy!" tomorrow. She was flying back from France yesterday (Thursday) to start rehearsals with producer Jack Good the same day. She'll sing her record hit "Last Night On The Back Porch" and is also expected to do duets with Marty Wilde and Don Lang. Last Saturday, Cliff Richard was absent due to illness. His routines were taken over by Bill Forbes. Alma Cogan makes the first of two appearances in the series. She sings her new single “Last Night on the Back Porch” and duets with Marty Wilde. Alma returned for the 2nd May show when she dueted with Cliff Richard. The pair developed a good friendship and they made frequent guest appearances on each others forthcoming TV spectaculars for the ATV network in 1959 to 1961. Shirley Bassey makes her second and final appearance. Billy Fury makes his first of six appearance on the show. British vocal group The Mudlarks make their only appearance in the series. Neville Taylor and the Cutters are absent for the second week running. ALTHOUGH Cliff richard had planned to complete his northern concert tour last week, even after losing his voice at the Wednesday night performance in Hull, he found it impossible to continue. Hurriedly, "Oh Boy!" TV personality Cuddly Dudley was secured for the remainder of the week, joining other members of the package show Wee Willie Harris and Tony Crombie and his Rockets. After promoter Arthur Howes said last Wednesday night that Cliff Richard was agreeable to fulfil the remaining dates in spite of having lost his voice completely, later the same evening Cliff encountered insurmountable problems. Two members of his group, The Drifters, were victims of influenza and Cliff's own difficult position deteriorated as well. Under the circumstances, the unit were reluctantly forced to abandon their brave attempts and returned to London. It is pleasing to report that after a few days of complete rest Cliff's vocal chords were functioning easily again earlier this week, enabling him to commence rehearsals on Wednesday afternoon for the "Oh Boy!" show on February 28. Furthermore , it was planned that, together with the Drifters, concerts and other commitments would re-commence at Birmingham Town Hall tomorrow (Saturday). At Edmonton last Sunday, Marty Wilde filled the breach( besides broadcasting in "London Lights" the same evening) with Cuddly Dudley and Wee Willie Harris. A HIGH COURT injunction sought to prevent Jack Good from continuing to use the name Lord Rockingham...bandleader-arranger of the "Oh Boy!" TV series forming his own group, Harry Robinson's "Hootsmen"...a statement suggesting several musicians in TV's Rockingham's XI are breaking away in order to join forces with Robinson's new line-up...a solicitor's statement that contracts will be signed this week by Harry Robinson's Hootsmen with a leading disc label - these are the startling highlights of a raging inferno which has emerged since the NME's exclusive revelation last Friday of an attempt by Robinson to secure the Lord Rockingham name. Today ( Friday) in the High Court, Harry Robinson will seek an injunction to prevent further use of the name Lord Rockingham by TV producer Jack Good. In a lengthy statement issued by Robinson, he alleges that his action is not over money, but the principles involved. He suggests Good's manager, Edward Summerfield, made a statement in last week's NME which was innacurate and in his words, "must be corrected." Apart from variations of Robinson's views, printed by the NME last week, additional information in his statement includes the following: "I greatly admire Jack Good as a brilliant producer with fresh ideas, but he is not a trained musician." Robinson continues with the admission that the name and title "Lord Rockingham's XI" was invented by Good - but it had now become inseparably attached to him and in the public eyes it would be harmful for him to present any music under any other name. Also it would be unfair to him (Robinson) if any other bandleader was to be regarded as Lord Rockingham. Robinson alleges that after refusing to sign an exclusive contract with Good's manager Edward Summerfield, there followed advertisements in musical papers stating Jack Good owned copywright of the Lord Rockingham name. This prompted Robinson to instruct solicitors that an immediate letter demanding a withdrawal of this statement be made. He admits however, that the request was refused and the High Court injunction he seeks now is concerned with establishing the right to the name Lord Rockingham. Earlier this week, Robinson expressed the view that with only one exeption (aprt from featured organist Cherry Wainer and her own drummer), the remaining members of the "Oh Boy!" resident Rockingham band would not be continuing after March 7, but instead had signed with his new group. By Wednesday, the resignations were not as anticipated, when Jack Good announced that five instrumentalists had agreed to remain, leaving only four players uncertain. According to Robinson, when the musicians of the TV XI were offered contracts by ABC for the remainder of of the "Oh Boy!" series (from March 14-May13), he did not receive any extension after his current obligation, which ends on March 7. On Good's behalf, Edward Summerfield commented: :Having already sent a solicitor's letter making claims to the title, how could Robinson expect to be signed to the remain with the show after that? Summerfield's statement in last week's NME alleging thet the whole idea of Lord Rockingham's XI was pioneered by Jack Good, and that after formulating the sound required, Good engaged Robinson and conveyed to him the musical treatment rquired, was strongly denied by Robinson. He asserted that besides arranging and composing all the bit tunes for their Decca records, he was bandleader of Lord Rockingham's XI from the outset. He further added: "Jack Good asked for a distinctive sound, I was the one who experimented and found one." Questioned by the NME regarding his immediate plans Harry Robinson would not reveal the recording company which had signed his new "Hootsmen" orchestra, nor would he intimate the name of any business representatives who would be connected with his future. However, our independent enquiries indicated, on reliable authority, that Pye-Nixa is the disc label concerned; furthermore, it is envisaged that Bunny Lewis (who represents the Mudlarks), is connected with the question of future management. Finally, Edward Summerfield made the comment: "This hardly seems like gratitude for the opportunity Jack Good has created for Robinson to amass several thousand pounds as composer of Lord Rockingham disc titles." Decca, in providing recent Press material concerning the group, stated (in writing) thsat the "Hoots Mon" record sales alone had yielded Robinson composer royalties of over 5,000 pounds. Despite the dispute, Robinson is expected to fulfil his "Oh Boy!" contract until March 7. No one could be more frustrated and disappointed than I was when my doctors ordered me to rest my throat and take a holiday last week. I'm glad to say everything is fine now and I'm rarin' to go on Saturday at Birmingham. My quick recovery is thanks to my surprise "lost weekend" - or rather the weekend I got lost! I'd like to tell you about it here in my favourite paper. First - why it happened. After managing to struggle through six hours recording my Columbia LP-"Cliff Richard And The Drifters"-last Monday and Tuesday, my voice went completely on the Wednesday morning. The doctors assured me that the throat was not affected by a germ, but was seriously strained and was a culmination of ceaseless work during the past week-travelling up and down the country, one night stands, appearing on the weekly "Oh Boy!" show, making a film and playing in variety. Even with my voice gone last Wednesday, I refused to give up, and rather than let my Hull fans down that night, I insisted on undertaking the 200-mile journey from London and appearing on stage there, even though I couldn't sing. This northern audience gave me a wonderful reception. But, unfortunately the trip was too much for me and two of the Drifters - Tony and Bruce - also were sick with the flu after the show. In these sad circumstances, we very reluctantly had to give up the rest of the tour and I'd like to say to all those who had booked for it "I'm very sorry." My doctors insisted that I take a complete holiday and I made arrangements to go to the South of France. Seats were booked on a BEA flight to Nice last Saturday, but, unfortunately, as luck would have it, there was a last-minute hitch and it was impossible to get the passport through in time. Just as this disappointing news was being phoned through to me, and made me feel blue after the joy the many Valentines I received had brought me, two friends - Dave and Ray - happened to call in to see how things were going and immediately they heard my difficulty they hit on the idea of all three of us motoring "into the blue" for a couple of days, not letting anyone know where we would be. I thought it wasa a great idea! So, after hurriedly packing a toothbrush, a few belongings, my portable gramophone and a stack of records, we set off in Dave's Riley in a southerly direction without anyone - not even my parents knowing where we were going. Oncethrough London there was a quick discussion as to where we should make for, and eventually on my suggestion we headed for Brighton. After stopping en route for some medicine and capsules that the doctor had prescribed, we reached Brighton at three in the afternoon. We selected a small hotel right on the front, with rooms overlooking the west pier and beach. Booked in, we set out for a short walk along the sands, as my doctors told me to get as much fresh sea air as I could. I was muffled in a woollen scarf and overcoat, and hoped I would be able to walk around unrecognised. But my pink socks gave me away. It was not long before I had the feeling of being followed. After signing autograph books, we went into a record shop and bought several discs, including Little Richard's "Baby Face," Nancy Whiskey's "Johnny Blue" and "Problems" by The Everly Brothers. I was determined not to miss the "Oh Boy!" show and searched around until I found a coffee bar with a television set. From 6 to 6.30. I spent a busman's holiday watching Jack Good's programme, and felt very envious of everyone having such a good time on the show, and I determined more than ever to get better quickly. A little later my attention was caught by a large poster advertising a science fiction film. I go for them, but rarely have the time to see any. So the evening was spent watching "The Cage Of Doom," supported by an even more blood-curdling film, "The Screaming Skull"! I don't think they'll mae the hit parade, but I loved them. I forgot my frozen orange on a stick, and there wasn't very much left apart from the stick. Breakfast of bacon and eggs, twelve hours later on the Sunday morning was served in bed and then, after writing cards - pictures of myself and captioned "Cliff's at Brighton"- to my parents and three sisters. I decided to pay a quick visit to the local sports stadium where the Show Biz Eleven were due to play soccer against a team of managers. Well protected with two scarves around my neck, I spent a brief 20 minutes seeing my friends - Jim Henney, Glen Mason and his ex manager, Franklin Boyd - playing some highly entertaining soccer. This made me feel suddenly energetic, because driving away from the stadium, still being hotly persued by fans, I thought I would like to try my hand on the Sea View golf course. All this exercise built up a good appetite and so I enjoyed poached egg on top of a Welsh rarebit in a nearby cafe. Back once more at the hotel, I switched on my gramophone, and for the next two hours listened to discs by Elvis Presley, Tommy Sands and Ricky Nelson, who I think are the greatest. During this time I was feeling rather sad because it coincided with the time that I was supposed to be appearing at the Regal, Edmonton. I only hope I can make it up to everyone there soon. This had been a date to which I had been looking forward to for many weeks. To round off the day, an expedition was made to the Nanking Restaurant in the famous Brighton Lanes, where I ordered my favourite dish of chicken curry. On Monday morning I spent a very enjoyable hour at the Pier Pleasure Grounds on the dodgems, the pin-ball machines and the rifle range. On holiday, I have always enjoyed taking home presents for my family, and so the rest of the morning was spent in choosing suitable gifts. After quite a lot of looking around, I finally selected a 3lb presentation box of chocolates for Mum and a new shaving brush, soap and blades for my Dad, and extra large sticks of rock for my sisters. Shortly after midday it was time to leave Brighton and return to London. And as I said in the car, it was a fabulous break. I felt much brighter than I had 48 hours previously. The sea air during my "lost weekend" had certainly done me a power of good! Now to make up for "lost" time. I'm all set to "Get Movin'" again! Gerry Dorsey, later to change his name to Engelbert Humperdinck, makes the first of 2 appearances on "Oh Boy!". Newcomer Rikki Henderson makes his one and only appearance. Dickie Pride the "Sheik of Shake" makes his debut performance on "Oh Boy!". This show also marks the debut appearance of Tony Sheridan. Jack Good's attentions during these weeks in February were focused on the all important 7th March 1959 edition which would be the first show of 13 to be telerecorded for export to ABC in America. Although he had no big American names for this key broadcast (the earliest bookings of US stars he could manage to clinch were in April and May) Jack secured the cream of British talent, including Cliff Richard and Marty Wilde to ensure this particular show was a memorable one. “Oh Boy!” show details for 7th MARCH in the MARCH 1959 diaries. for more details of the American “Oh Boy!" broadcasts.